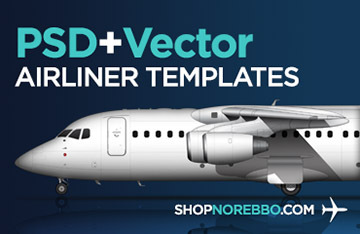 Once again, I’m going to kick off this post with a huge “thank you” to everyone who voted in the “what is Norebbo’s next aircraft template?” poll over the past week. I realize that my current way of asking that question it’s a little bit clumsy since I don’t have an official polling system in place, but I do appreciate all the blog comments and messages via email, Instagram, and Twitter. I’m going to work on setting up an official polling system soon, which should help to make this process more organized and transparent going forward. Anyway – long story short, it was the 737-10 MAX (also known as the “MAX 10”) which received the most votes, and true to my word, it was the template that I created this week. You might be interested in knowing that it didn’t win by much though (like, just 2 votes actually). 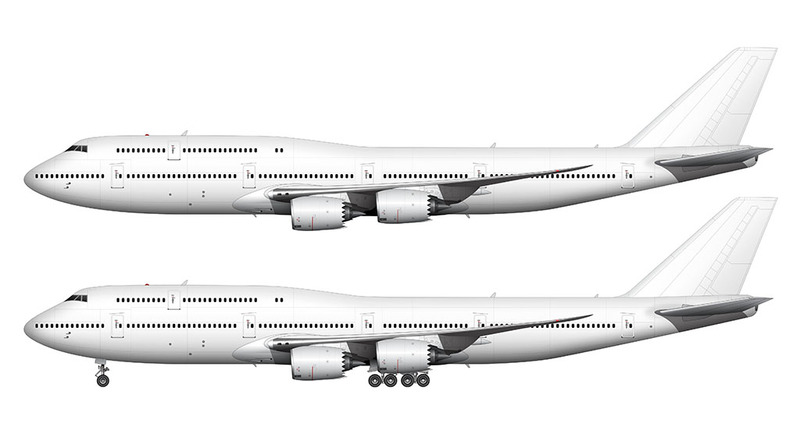 I’ve also been getting a lot of requests to build out the entire 747 series, which kind of surprises me considering that it’s only been in the past year or so that I first started hearing these requests. When I first created my 747-400 template way back in 2013, it didn’t get much interest. Weird, right? It gave me the impression that doing 747 templates was a waste of time and I should be focusing on other “hotter” aircraft (or not doing aircraft templates at all). Wanna know a secret? I didn’t actually want to do the 737-10 MAX. Not because I spent a month and a half on building out the entire 737 series last summer and I was already kind of burnt out on it, but because it’s an aircraft that doesn’t even exist yet. The 737 MAX 10 exists only in rendering form on the Boeing website, which made me feel uneasy plowing ahead and spending the time to create these intricate and very detailed illustrations. 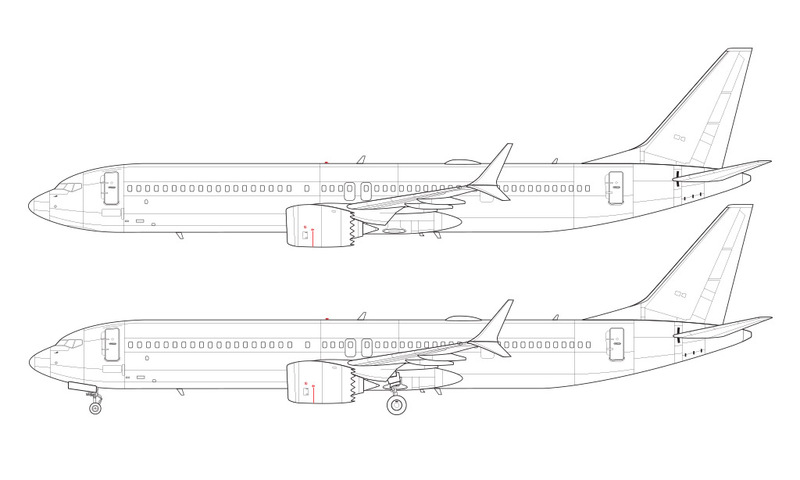 Technical side profile line drawing of a Boeing 737-10 MAX. As weird and strechty as the 757-300 IMHO. Since this aircraft is still very much in development, there’s a lot that can change between now and the time when it’s released in 2020. Thankfully, the changes over the 737 MAX 9 aren’t all that extensive, and I felt comfortable enough going ahead with the drawings. What’s new with the 737-10 MAX? Not a lot actually. This makes me happy for two very good reasons. First, it makes my job of creating these highly-detailed side view drawings much easier. And I am all about simplicity of these days considering the massive list of complex aircraft that I have on my to-do list. It’s a pretty scary list if I’m being honest, and I’ve got to save my energy if there’s any hope of tackling the entire thing. The second really good thing about the lack of significant modifications over the 737-9 MAX is the fact the 737 line has run it’s course and should’ve been stopped 10 years ago. OK, that may not be totally “fact”, but it’s just my opinion and I know that there are many others out there who would agree. Of course there are others who won’t agree, and that’s cool too. The bottom line is that the 737 has been around for nearly 50 years now, and well…maybe it’s time to drive a stake through its heart and move on to an all new and more efficient design? When the 737 MAX 10 was proposed back in the middle of 2016, it called for an extended wing and a larger engine. After extensive testing (and presumably finding the limits of the 737 airframe) Boeing scaled that back a bit and gave up on the idea of making such significant changes. 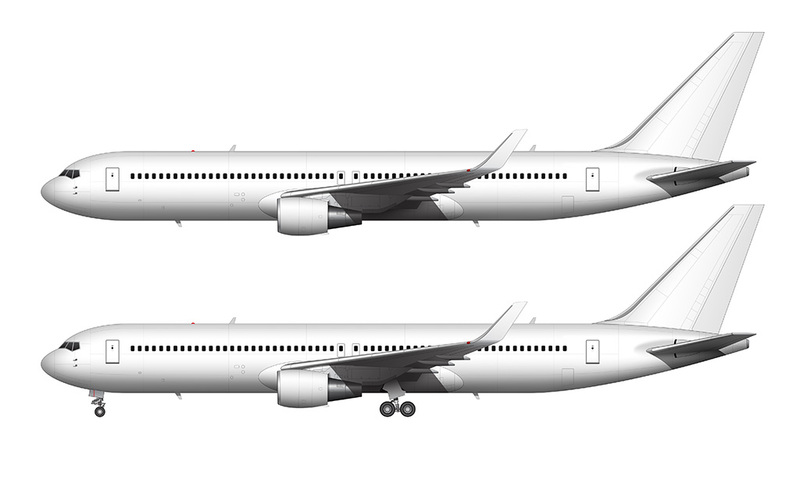 In the end, the only major differences over the 737–9 was an extended fuselage (66 in / 1.7 m) and a taller (9.5 in) landing gear. That’s it. When it came to making these illustrations, the fuselage extension wasn’t all that big of a deal. 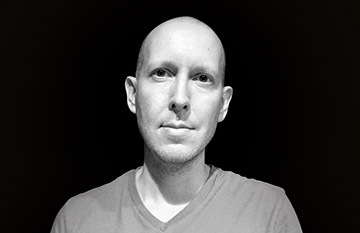 I could very clearly see the increased length in the renderings, and it was just a matter of extending my existing illustrations to match that new length. Easy. The thing that gave me a bit of heartburn was the fact that the design specifications call for a 9.5-inch extension of the landing gear, which I haven’t been able to find any diagrams for yet. I also keep seeing references to a slightly redesigned shock absorption system, but I haven’t been able to find any pictures of what that looks like either. Because of that, I simply had to extend the landing gear structure in my existing 737 max illustrations, and make a personal note to myself that I’m going to have to come back and re-draw this portion in a year or so. I hate having unfinished illustrations floating out in the wild! Anyway, even though this template isn’t totally complete, it’s good enough to call “done” for now in the hopes that some of you out there can use this as-is for whatever projects you’re currently working on. Keep in mind that if you purchase this template on my store, you will always receive free updates whenever I make them. The landing gear update will happen eventually, and you’ll automatically get it when it’s released. Finally, those of you who have been waiting for the 747 build-out will be happy to know that that process has already started and I’m working backwards from the 747-400. This 747 project is one that I’m going to be working on in parallel with some all new aircraft templates, so even though I might not have everything complete by next week, you can feel good knowing that it’s happening in the background and I hope to start posting them soon. Are you planning on doing to CRJ-1000? To be honest the first thing I do is look at the bottom to see the next airplane he will do. Then I saw it will be a surprise. Maybe a Concorde?